"This is a very healthy bran muffin, with buttermilk and molasses, and also very good." Preheat oven to 350 degrees F (175 degrees C). Grease muffin pans or line with paper cups. In a large bowl, combine all purpose flour, whole wheat flour, wheat bran, salt and baking soda. Add molasses, buttermilk, egg and butter; stir just to moisten. 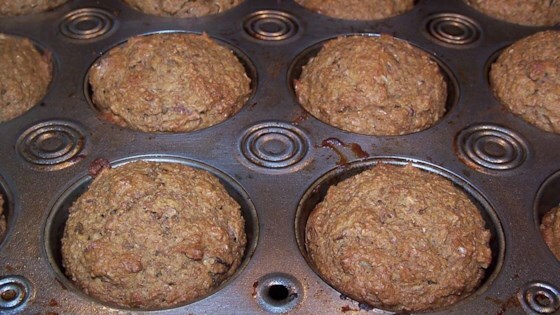 Scoop batter into prepared muffin pans. Cups should be 2/3 to 3/4 full. Bake at 350 degrees F (175 degrees C) for 20 minutes, or until a toothpick inserted into the center of a muffin comes out clean. Moist, with a nice texture, but I thought it needed a bit of sweetness. I think I'll try again with a bit of honey or sugar. These muffins are extremely moist and delicious. I added 1/2 c. raisins, 1/4 c. brown sugar, 1/2 t. cinnamon, 1/4 t. nutmeg and 1/4 t. cloves. I will definitely make them again.